The president, so quick to tweet 'recognition' to terrorists, law enforcement officers, good guys with guns, bad guys, and assorted other notables, FINALLY made a courtesy call to James Shaw Jr. on Monday. Shaw, in case you don't remember, was the guy who grabbed the AR-15 Travis Reinking used to kill four people and injure others at a restaurant. Last month. You know, in April. We learned about the phone call not from one of the president's tweets, but rather from Principal Deputy Press Secretary Raj Shah, at Monday's daily press briefing. This morning, the President had a call with James Shaw Jr. to commend his heroic actions and quick thinking last month at a Waffle House in Tennessee. Mr. Shaw saved lives when he wrestled a gun from an active shooter who had opened fire. 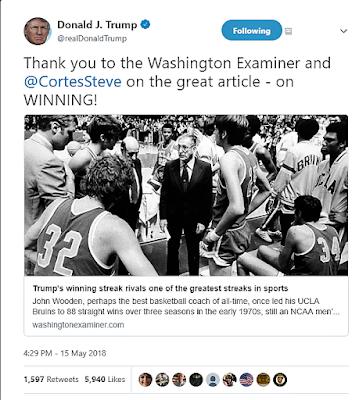 I find it interesting how the president has plenty of time to tweet about himself, but so little time to tweet about a regular American doing remarkable things for others. A paid law enforcement officer responding to a call is a 'hero' for doing their job, but a guy like Shaw? No comment, for days which turned into weeks. 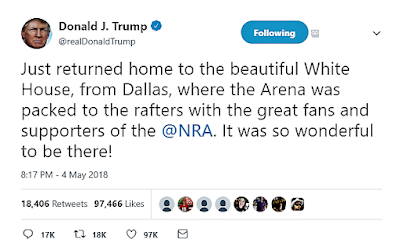 For example, the day the president went off to Dallas for his campaign rally at the NRA meeting, he was able to tweet as soon as he made it back to the White House. 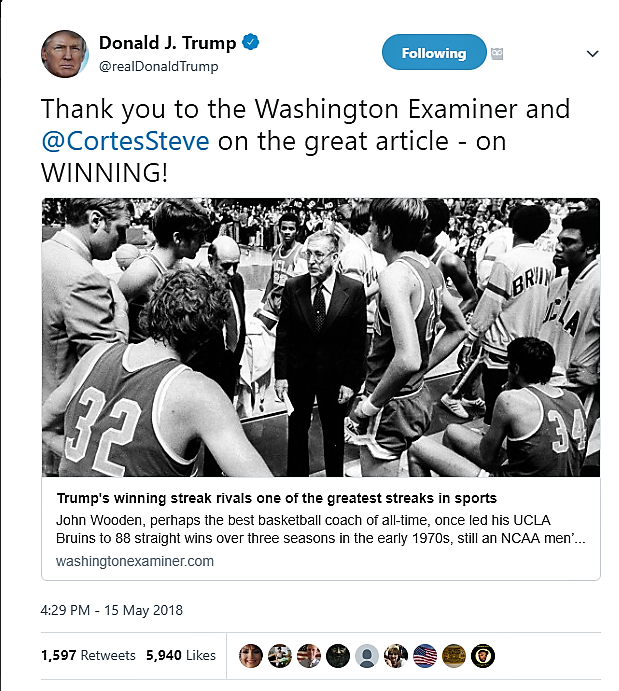 Or, how he did find time to tweet about himself and #winning - because talking about a favorable article is better than thanking someone else for their courage and for saving lives of other regular Americans. 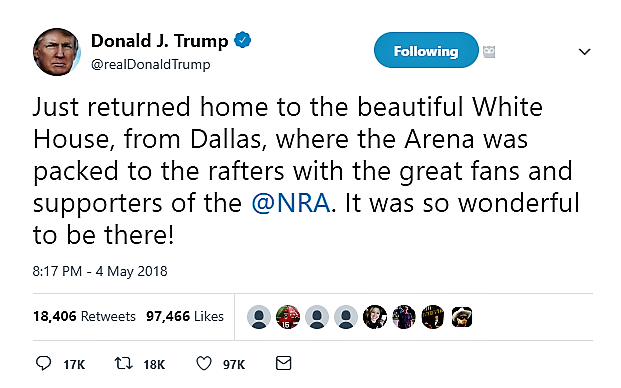 At any time since the shooting back on April 22nd, the president could have acknowledged and sent sympathies to the families of the victims, but he didn't. At any time since the shooting, Shaw could have been recognized for visiting the other victims of the shooting in the hospital, or for starting a GoFundMe page to raise money to help pay their bills, in addition to being a "quick thinker." It feels selfish (the recognition). I was just trying to get myself out. I saw the opportunity and pretty much took it. I chose to react because I didn't want to die. I just wanted to live. I didn't really fight that man to save everyone else. That might not be a popular thing to say. There's four families that are grieving right now. So much life was lost for no reason. I feel like it could be very selfish of me if I didn't point it out. And I apologize. I get the sense that Shaw was not holding his breath waiting for the president to call, and that's OK too. The fact that he did have to wait this long is a darn shame. We all (including the president) could learn something from Mr. Shaw, about humility, and kindness, and honesty, and what it means to be a good guy - even if all you have to defend yourself, and others, is your bare hands.